The Heart of Borneo Initiative is a transboundary effort between Brunei, Indonesia and Malaysia to enable conservation and sustainable development that improves the welfare of those living on the island while minimizing deforestation, forest degradation and the associated loss of biodiversity and ecosystem services. Conservation districts put sustainable development right into the hands of local governments. For WWF and partners, making conservation districts a reality has become a priority for effective protection of the Heart of Borneo. The HoB Governments have already begun to take coordinated action to recognise and act upon the value of natural capital. These bold steps—undertaken based on an enhanced recognition of the importance of HoB’s forests, freshwater and biodiversity— represent the beginning of a journey towards an economy that respects nature and is at the service of people. The Green Business Network is the gateway to new environmental solutions for your business. Make your business part of a sustainable solution for the Heart of Borneo—one of Asia’s largest remaining natural rainforests. 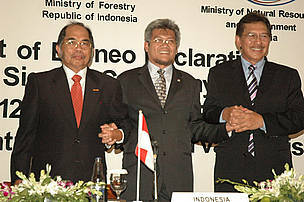 Ministers from the three Bornean governments sign the Heart of Borneo Declaration. From left: Brunei Industry and Primary Resources Minister Pehin Dato Dr Awang Haji Ahmad bin Haji Jumat; Indonesian Forestry Minister M S Kaban; and Malaysian Natural Resources and Environment Minister Dato' Seri Azmi bin Khalid.